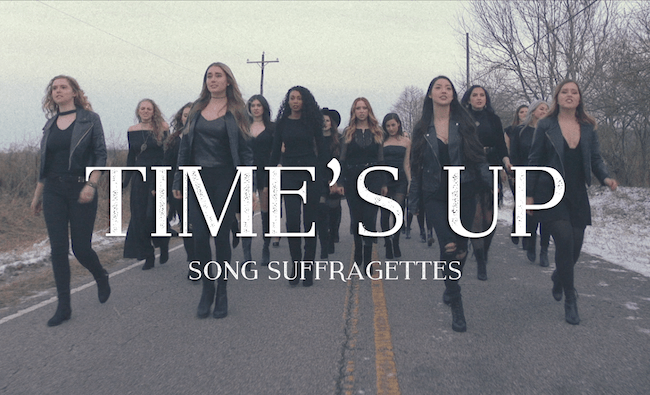 Nashville’s all-female singer-songwriter collective, Song Suffragettes, pointedly address gender inequality and sexual misconduct against women with a new song aptly-titled “Time’s Up” and an accompanying music video. The project and the women involved give a direct and unapologetic voice to the injustice and mistreatment of women everywhere, both inside and outside the entertainment business. The song and music video have already been embraced by iTunes and Apple Music, who added the song into their top playlist: A-List Country. Radio Disney Country will premiere the song today and feature it on the Radio Disney Country Spotlight show airing on Radio Disney. The music video arrived at midnight last night on VEVO and you can watch it here. The proceeds from the sale of the song will benefit Time’s Up, an organization that created a unified call from women in entertainment to end discrimination, harassment and abuse of women everywhere. The 23 voices featured in “Time’s Up” come from all over the U.S. and Canada and all have unique stories and musical directions. You can learn more on each participating artist here (women listed in order of appearance in the song): Kalie Shorr, Tasji Bachman, Chloe Gilligan, Savannah Keyes, Mignon, Gracie Schram, Tiera, Jenna Paulette, Emma White, Jordyn Mallory, Emma Lynn White, Regan Stewart, Kim Paige, Jenna McDaniel – Madison Kozak, Jenny Ray, Tenille Arts, Tristan McIntosh, Tia Scola, Alexis Gomez, Candi Carpenter, Trannie Stevens, Lena Stone (does not appear in music video). Song Suffragettes is a collective of female singer-songwriters who perform every Monday night at Nashville’s Listening Room Café. With a mantra of #LetTheGirlsPlay, Song Suffragettes has featured close to 200 women in the past 3+ years resulting in multiple publishing and record deals for some of Nashville’s brightest talent. For more information please visit http://www.songsuffragettes.com. Kalie Shorr burst onto the Nashville music scene in 2016 with her self-penned hit “Fight Like A Girl”. The Portland, Maine singer-songwriter became a Sirius XM Highway Find and was praised by Spotify, CMT, Radio Disney Country, Taste of Country, and even Billboard magazine. In 2017, Kalie released her Slingshot EP to rave reviews and was named “New Artist You Need to Know” by Rolling Stone, “The New Nashville” by Teen Vogue, and one of “2017’s Hottest Artists Under 25” by Taste of Country. Her newly released single “Two Hands” has already been added to Sirius XM, Radio Disney Country and TuneIn with prominent placement on Apple Music’s Breaking Country and Cool Country playlists. With a new EP coming January 26, 2018, Kalie was recently inducted into CMT’s Next Women of Country Class of 2018 and has just been announced as support for the Sara Evans All The Love CMT Next Women of Country Tour. Playing over 100 shows a year, Kalie’s message of female- empowerment has led to her being called the “next ‘Women of Country’ generation” [CMChat] and a “modern country woman [who will] continue to inspire in 2018” [TasteofCountry.com].